She carries a huge plastic beach ball with a globe design on it. But she isn’t taking us to the beach. Anke Tijtsma is taking us to when she was thirteen and deeply impressed by band aid. We are the world, she sang, we are the children, and she was touched. Suddenly she felt very connected to children here and far away. What touched her most was the line ‘We’ll make a better day, just you and me.’ She wanted to help. So she started selling fair trade coffee in her local village. Action here, impact there – and her motto was born. Interconnectedness. It moved her then, and still does now. But interconnectedness does not only mean what we do has an effect on people abroad, it also works the other way around. Maybe Anke Tijtsma still sings We are the world now and then, but working abroad made her broaden her view. Her fight now is for a world where health is unlimited. A world where care for ourselves goes hand in hand with care for people abroad. A world where we apply a global perspective to health. 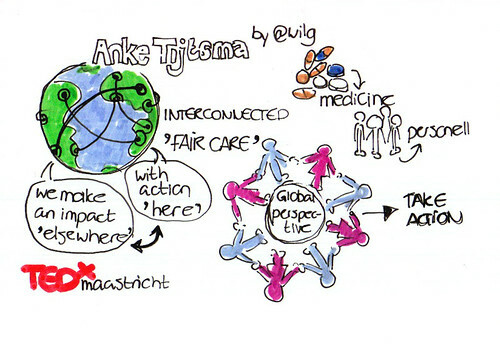 A world where a dutch healthcare system with fair care and health unlimited for everyone is no dream. Dutch hospitals, insurance companies and the government could help to create this world where health is not limited to a happy few. One thing we can do here that greatly affects people abroad is the use of antibiotics. Every year, 25000 people die of bacterial infections that can no longer be treated due to antibiotic resistance. If we go on like this, there will be no antibiotics for us nor anybody else in the near future. Putting health in a global perspective means we have to stop the irrational use of antibiotics, both in human healthcare and veterinary healthcare. Anke Tijtsma is also worried about the shortage of medical staff. Relatively small in The Netherlands, but us hiring people from abroad causes a new shortage somewhere else. Not really a fair care solution. We can do better. By training people here to work here. By creating perspective. Corporations: take your responsibility, says Anke Tijtsma. It is up to us to create fair care. It IS possible. According to the legendary anthropologist Margaret Mead, a small group of people can realize a big change. It happens every day.